You think you know luxury? Wait until you see Beacon Hill’s newest high-end building. 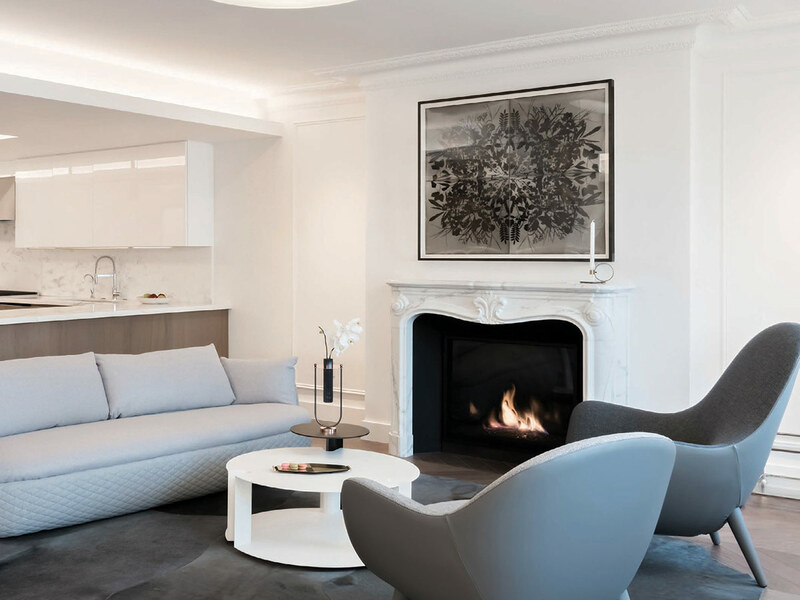 Channeling the historical-meets-modernist vibe that he admired when living in Paris, Boston-born developer Marcel Safar, founding partner of Chevron Partners, has created a new paradigm for residential design in Boston. Maison Vernon flawlessly combines traditional and contemporary design in an architecturally signicant 1917 brick building with a carved limestone facade at 39- 41 Mount Vernon St. in Beacon Hill. “We’ve layered cherished architectural elements with sleek modern design and luxury amenities,” says Safar. Chevron Partners tapped local and European artisans for the nishes in the seven condominiums and lobby. The team, which includes Bostonbased architecture firm Meyer & Meyer, was relentless in execution. “We built and rebuilt the columns multiple times to get them right,” says Safar. He is referring to the pristine columns in the units’ main living spaces, which are a striking juxtaposition to the fanciful handcast plaster moldings. “We kept the columns bare and clean for contrast and also to keep the space light and balanced,” Safar says. Other details in the units include three-sided glass replaces and French white oak chevron ooring. Interior designer Kate Kelly worked with homeowners to refine their nearly 3,000-square-foot space on the fifth floor. “They’re a very casual family, so the few changes we made—enclosing the media room with custom millwork and glass doors, and using stone and tile in textured and matte nishes—reect their laid-back approach to living,” she says. Locally sourced modern furniture in sloping silhouettes, including a Moooi Bart sofa from Casa Design Living, Poliform Mad lounge chairs from Showroom and a Minotti Jensen Bergère lounge chair from Montage, complement each other and the design. “Marcel used extremes of the traditional, like ornate plaster moldings, alongside extremes of modern, like at panel millwork stripped of detail,” Kelly says. The result is unexpected, fresh and timeless.